B & H Engineering, P.C. 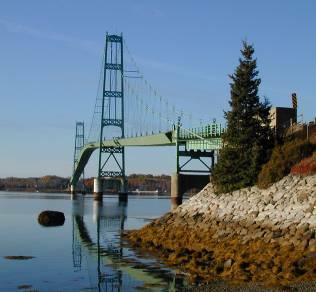 has performed 2001 Biennial Inspection of the Deer Isle-Sedgewick Bridge, as a prime consultant, for the Maine Department of Transportation. Services included inspection of main cables, suspender ropes, cable stays, cable and stay bands, stiffening girders, fairings, floor beams, crossbeams, wind tongue, bearings and rockers; finger joints, support beams and concrete deck. Approaches and abutments; navigation lights, quality assurance, reporting flagged conditions, preparation of final reports, planning and scheduling inspection; and monitoring work zone traffic control on the Bridge and local streets.